Boise State's Malek Harwell fights through defense from Colorado State's J.D. Paige and Kris Martin during the second half at Taco Bell Arena Wednesday, Feb. 27, 2019 in Boise, Idaho. CSU won the game 76-62. It’s hard to put lipstick on a pig after what happened to Boise State in Taco Bell Arena Wednesday night. Colorado State took advantage of the Broncos’ missing confidence and dominated. BOISE, Idaho — Thursday, February 28, 2019. Let’s get the slop out of the way off the top. The hoop must look like a thimble to Boise State the way it shot in Taco Bell Arena last night in a 76-62 loss to Colorado State. The Broncos made just five of 27 three-point attempts and went 3-for-7 from the free throw line. “Our big emphasis was getting the ball moving tonight, and we did the opposite,” said coach Leon Rice on the Learfield/IMG College postgame show. There’s not much more to say. 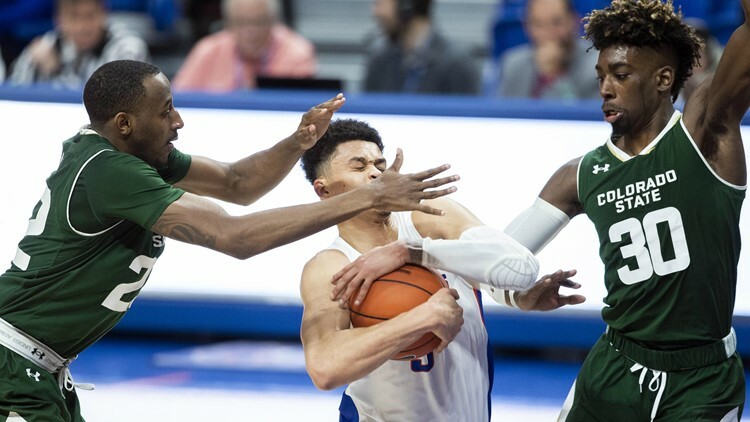 Boise State not only saw its five-game winning streak against CSU snapped, it has its first four-game losing streak in four years as it falls to 11-17 on the season. There’s a tailspin goin’ on. The defense was out of sorts, too, as the Rams shot 58 percent from the field and made their buckets in a multitude of ways. Center Nico Carvacho, CSU’s double-double machine, recorded his 19th such game of the season with 19 points and 14 rebounds. About the only high point was Justinian Jessup, who poured in a career-high 25 points on 10-for-17 shooting. R.J. Williams scored 10 points while going 5-for-7 from the field. That means the rest of the Broncos went 12-for-44. Derrick Alston was 2-for-11 as he kept trying to shoot his way out of the doldrums. The Boise State women lived dangerously Wednesday night in Fort Collins. The Broncos led by seven points over last-place Colorado State with 1:40 left, but the Rams closed regulation on a 9-2 run to send the game into overtime at 59-59. It was there that Boise State regained its senses, and it went on to win 72-63. The Broncos were 10-for-12 at the free throw line in the OT. Guess what: Braydey Hodgins scored 20 points. Hodgins played all 45 minutes in the game while recording her sixth straight 20-point game. Riley Lupfer finally got on the floor again for Boise State, playing 13 minutes off the bench and hitting one of her two three-point attempts. Now I know what I’m doing for my birthday. FBSchedules.com reports that the Boise State home opener on the blue turf against Marshall has been moved to Friday, September 6. Writer Kevin Kelley said that’s “according to a copy of an amendment obtained from both schools via a public records request.” He must have really, really, really wanted to know. Anyway, the bad news is: it’ll now be a short week week for the Broncos following the Florida State game, and kickoff could end up at 8:15 p.m. The good news: the game could be headed for ESPN or ESPN2. It’ll be the first meeting between Boise State and the Thundering Herd since the classic 28-24 Broncos win in the semifinals of the 1994 Division I-AA Playoffs. Former Boise State stars Alexander Mattison and Brett Rypien went through their “Underwear Olympics” Wednesday at the NFL Combine in Indianapolis. And we learned that the Broncos were of by only 3/8 of an inch on each player’s height in its online roster last fall. Mattison was measured as 5-10 5/8 inches and 221 pounds (10 pounds more than his listed playing weight last fall). Rypien’s numbers were recorded a day early—he was 6-1 5/8 and 210 pounds, eight pounds above his roster weight last season. Mattison will be on the field Friday, and ironically, Rypien will be throwing to him as one of the Combine’s designated passers. The Idaho Steelheads were alternating goals with Kansas City Wednesday night until the Mavericks bunched up a couple in the third period and won 4-3. Elsewhere, Utah lost 4-1 to Maine, and Tulsa, was idle, so the Steelheads held on to first place in the ECHL Mountain Division. The Steelies are one of five teams in the ECHL to reach 70 points so far this season. Three of the others are fellow division leaders Cincinnati, Florida and Norfolk, and Toledo is the fifth, joining the club Wednesday. There are five Boise State athletes who have qualified for next week’s NCAA Indoor Track and Field Championships, all of them from the women’s side. Allie Ostrander will be a double-entry in the 3,000 and 5,000-meters for the second time in her career. By the way, after a miscalculation was corrected by the conference office, Ostrander was belatedly announced as the Women’s Outstanding Performer at the Mountain West Indoor Championships last week. And if the Boise State women’s gymnastics team is going to make the NCAA Championships this season for the first time, it’ll have to do it without Shani Remme. The Broncos’ star is out for the rest of her senior season after tearing her ACL last Sunday at Denver. Boise State hosts Washington and Utah State Friday night in Taco Bell Arena. College of Idaho has drawn Voorhees College of South Carolina in the first round of the NAIA Division II Championships next Thursday morning in Sioux Falls, SD. The Yotes, a No. 2 seed in the tournament, are 28-5, and the Tigers are 24-5. Meanwhile, C of I has produced a third straight Cascade Conference Defensive Player of the Year. This time it’s former Centennial High standout Talon Pinckney, who leads the league with 78 steals going into nationals. The Northwest Nazarene men can move into a first-place tie in the GNAC with a win over Saint Martin’s in Nampa tonight. The Nighthawks currently trail the Saints by one game. And the NNU women have their showdown set with Alaska-Anchorage for the GNAC lead tonight at UAA. The two Division II top 25 teams are tied for first. In what was considered the biggest regular season game in Boise State history, the Broncos end 24th-ranked San Diego State's 29-game home winning streak with a 56-46 win at sold-out Viejas Arena. The Aztecs' defense suffocated Boise State in the first half, but it was the Broncos' defense that ruled the day, holding SDSU to seven points over the final 11 minutes of the game in rallying from a 39-32 deficit and moving into a tie for first place with the Aztecs in the Mountain West. The Broncos completed their “quadfecta” of road breakthroughs, with their first-ever victory at Viejas joining the ones earlier in the season at Utah State, New Mexico and UNLV.